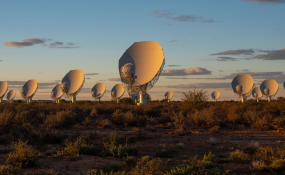 Over R300 million has been spent in the Northern Cape with the construction of the KAT-7, a proof-of-concept radio telescope, and MeerKAT, the precursor to the SKA. The South African Radio Astronomy Observatory (SARAO) spearheads South Africa's activities within the SKA, an international project. In 2005 the SARAO funded nine students to study in science. Last year it was 103. Altogether 1,000 students have received grants to study science and engineering - from graduate degrees to post-doctoral studies. Binneman told GroundUp: "The social problems in rural towns in South Africa are a massive challenge and a project like the SKA will not solve all these problems immediately. In the towns we are working in the difference is evident. "SKA is currently employing 100 people with full-time positions in Carnarvon and the organisation is spending substantial amounts of money in these communities." "There is nothing more gratifying than to change someone else's life for the better," she said. There is also a schools programme - which focuses on maths and science. Learners from schools in these towns who are interested in maths, physical science and natural science and who perform well in these subjects can apply to become part of the bursary programme. Since 2011, 72 local learners have received bursaries to study at technical colleges and 15 at universities. Kim de Boer, who runs SARAO's human capital development programme, told GroundUp that from 2005 to 2018, the organisation had spent about R455 million on grant funding. It's an exciting time to be an astrophysicist, he said. South Africa's MeerKAT radio telescope is set to deliver unprecedented views into the nature of galaxies. Rafieferantsoa is working on simulations that will interpret the huge amount of data the telescope will collect. "The quality of images from the MeerKAT array is unprecedented and crazy good - and who knows how insane it will be with the SKA?" he says. "I am a human being," Rafieferantsoa says. "That means I am curious and I am always in search of a way to satisfy that curiosity. It also means I'm part of a social species, and a thriving society, where every member is important. So I see myself contributing to the wellbeing of society in the years to come, in whatever field that might be." Under apartheid, as one manager at SARAO explained, the arms industry was a priority. Now many of the people who worked in that industry have moved over to work on the "more benevolent option", such as the MeerKAT engineering team. The needs of the SKA and MeerKAT are also pushing the limits of current technology. Local companies working on the projects are developing a "a competitive edge in the high-tech market", says SARAO's Justin Jonas.